At Beacon, we have a very diverse group of customers. And by diverse, we mean that every league is different with how they are managed — how they acquire players, how they fundraise, how they purchase equipment, how they select coaches, and how they manage & maintain their fields. 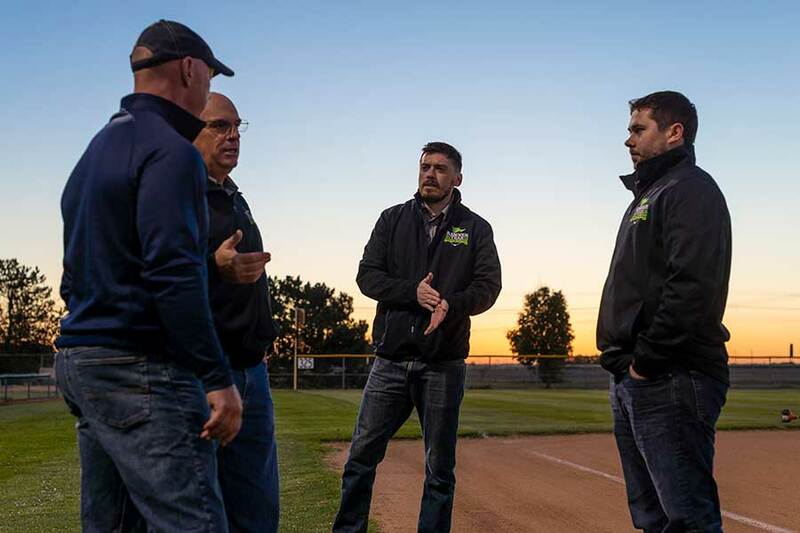 Managing the fields can easily become overwhelming for a board member or league, especially if your field is exclusively managed by coaches and volunteers. Apart from the occasional drag, chalk, or mow from a local park & rec department, it’s all on you. Many park & rec’s have amazing facilities that are managed with great care and detail. But, it’s still the responsibility of the league or the coaches to make sure the fields are maintained with safety and playability in mind. Are you one of those guys who keeps a rake and shovel in your trunk? Then, I’m writing this for you! That extra attention to detail and ‘ready-for-anything’ spirit will go a long way toward your success as a groundskeeper. No one wants to see a 9-year-old infielder take a bad hop, especially as you’re trying to teach them the importance of staying down on grounders. The tools on this list are basic tools that don’t require any gasoline or water and certainly do not require a big budget. But, every baseball league and softball league should really have these affordable tools in their shed. And, every volunteer should know the basics of how to properly use these field maintenance tools. It will save you time, save you headaches, and empower everyone to make the most of their time prepping your fields. You may even find a few of these already in your tool shed or garage. We all know rakes are important. There are many rakes to consider using, but this is one of our favorites. 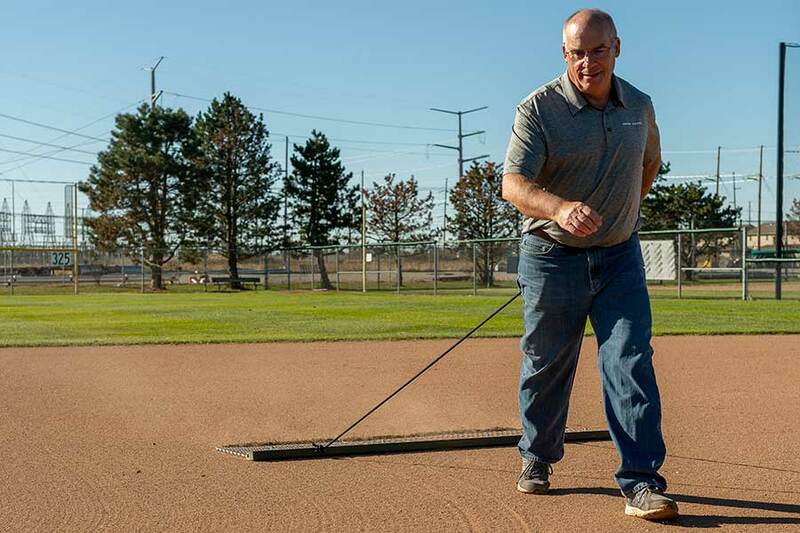 An infield rake can be used before and after practice or games to rake out cleat marks and divots, knock down high spots, and pull material to low spots — typically fielding position areas and sliding areas. 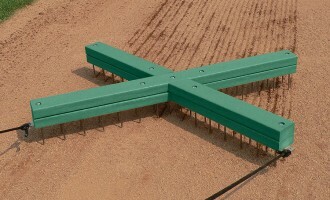 One of our favorite infield rakes is the Double Play Rake. 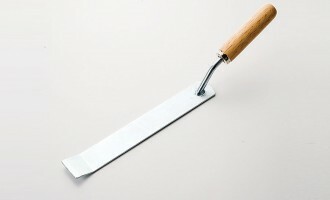 Use the short teeth for breaking up hard-packed clay and the long teeth for general raking and wet clay. Some prefer a straight edge on one side rather than teeth on both sides. With that in mind, the Wooden Field Rake, which has made its return after a dozen years away, is a great infield rake option. Learn more about Paul Zwaska’s sentimental favorite: Wood is Good! 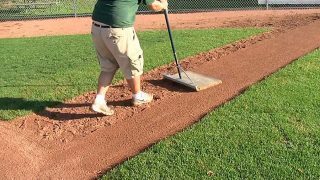 * PRO TIP: Always rake down the base line towards the base or home parallel with the edges, never rake towards the infield grass. Raking towards edges will cause lips that affect the roll of the ball and cause a natural dam which in turn will hold water. 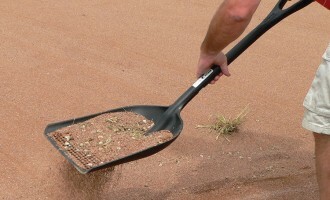 You can learn more about rakes at our Groundskeeper University lesson, “Shovels & Rakes”. You need to control your lips. 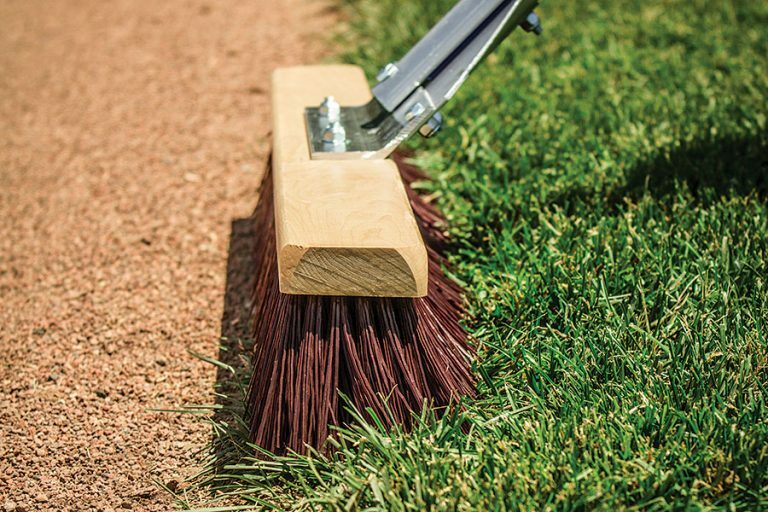 A push broom or standard leaf rake can be used fairly often to push material out from your turf edges. During games, material from the field is kicked or tracked against your turf edges. This generally results from the 1st and 3rd baseman moving into the grass for different situations. 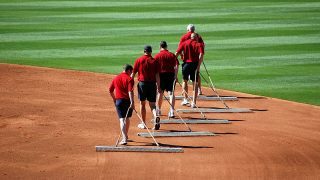 It’s also very common that material will move to your grass edge along the baselines from runners rounding the bases. 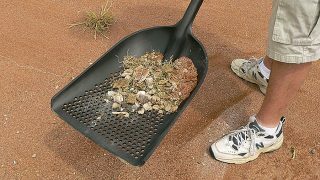 Many of these chunks of material can be picked up by hand and thrown back on the field to rake but it’s the material that you can’t see that slowly builds up. That is contributing to lips forming and that’s what you need to be concerned with. Regular use of the push broom or leaf rake can be an easy way to keep that buildup from becoming problematic minimizing lips. We have some great how-to videos on this topic, as well as an entire module at our Groundskeeper University online training tool which is devoted to addressing proper Lip Management. A hand drag is essential for grooming your field after it has been raked out. 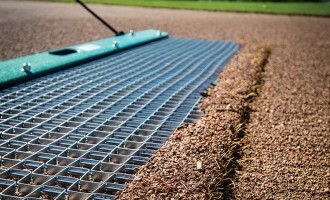 Steel mat drags help pull material from those high spots that were knocked down with the rake and they let you redistribute material to the low spots. If you have enough time, you’ll want to drag the field twice in opposite directions. Take your time when dragging to avoid being any closer than 6″ from cutouts and turf edges. Those areas may be better off being manicured with a broom or level board. If you have an uneven surface grade, you can try starting in the high areas of the field and end up in the low areas (usually where you will see the most standing water after a rainfall). 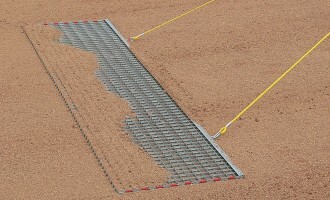 A rigid steel mat helps cut down high spots and fill in the low spots. For minimal displacement of material, consider our Pro Rigid Steel Mat with a leading edge and angled mat. A hand-pulled nail drag is small enough to not take up a lot of room in storage and you do not need a tractor to pull them. You’re the tractor. That’s very good news. And, even if you can only nail drag once or twice a week, you will definitely see a difference from scarifying your infield. Remember: a nail drag should be used before any mat drag is used. 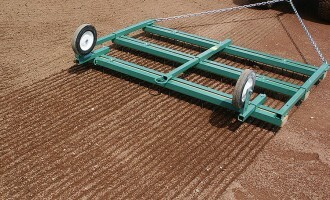 Nail drags by definition allow you to aggressively scarify your infield surface. It can help tremendously if you are able to nail drag after the field has received some moisture. Now, I don’t mean so much moisture that it sticks to the drag, that’ll make a mess. But, just enough moisture so you can easily loosen heavily compacted areas without digging in any deeper than 1 inch. You should complete the nail drag process with level boards or rakes to pull loose material into low spots and then finish with a nice and easy hand float drag. 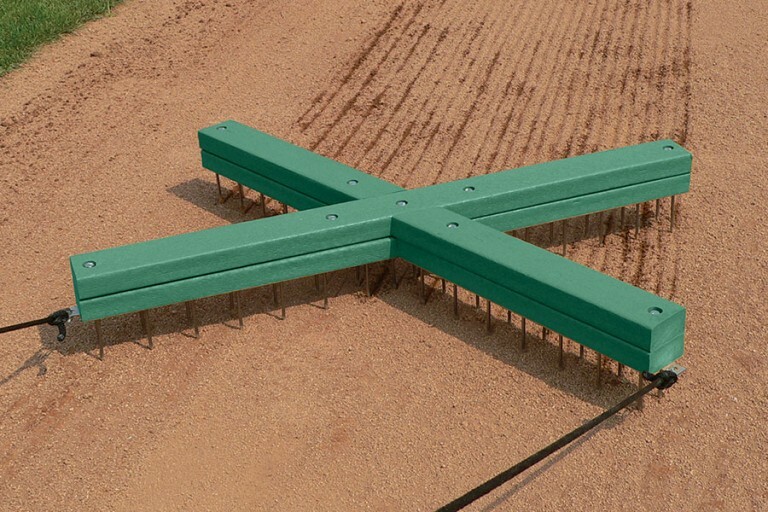 While larger nail drags are great for covering a lot of ground, they are bigger, more expensive and will require a tractor or some machine to pull them. 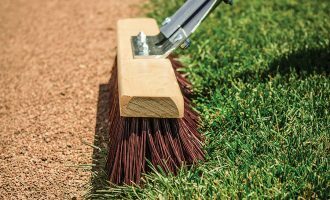 On the other hand, our X-Drag is an excellent option as a hand nail drag that you can use all over the infield skin — even in tighter areas like up and down the base paths. Just adjust the pull rope to go from a 3 ft wide drag to a skinny 2 ft wide drag. Our Groundskeeper U lesson, Scarifying the Infield Skin, will walk you through the finer points. A good scoop shovel is perfect for picking up debris and chunks from the piles of material swept from your turf edges, mound and home plate area. They can also be used to gather up and ideally sift the spoils from nail or mat dragging. 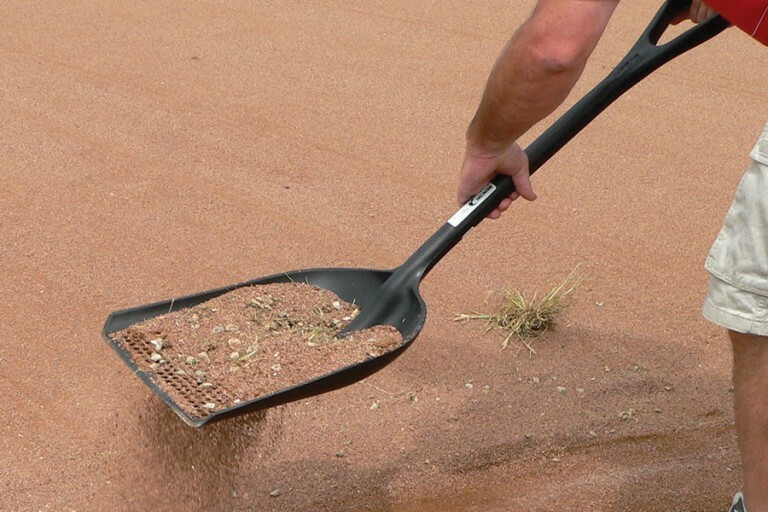 One of our favorites is the Sifter Scoop Shovel, but really any sturdy shovel will do. 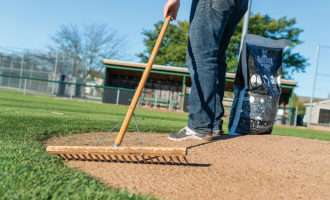 The advantage of the sifter shovel is you can sift through the good material back to your infield skin, and then toss the waste left in the shovel off to side behind your playing field. Being diligent about removing unwanted chunks, debris or rocks will help ensure you give your players a safe infield that plays true and minimize the random “bad hop” that infielders dread. Players also appreciate sliding into base without potentially painful debris or stones. You can learn more about shovels and rakes at Groundskeeper U’s “Shovels & Rakes“. 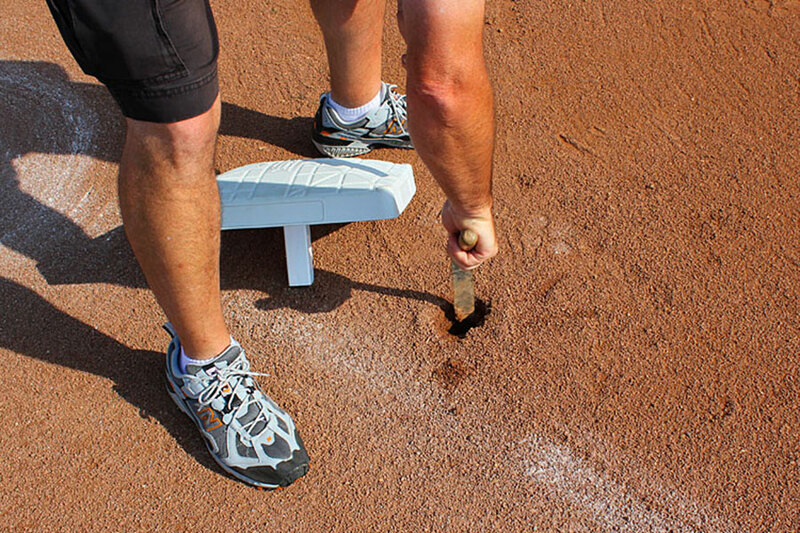 A tamp is needed to pack clay into the batter’s box and pitching mound after they have been repaired. These heavy-wear areas are frequently damaged. If your park & rec department or the field managers at your facility are not regularly repairing these areas, you will need to figure out how you can keep these areas safe from hazardous holes that form after heavy usage. 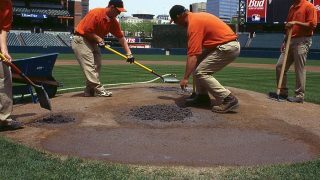 If your league or team does not have the ability to acquire bagged clay to correctly repair these areas, we have some alternatives. Products like our Beacon Porous Rubber Mats or the Jox Box can be installed below grade in these areas to minimize damage and prevent holes. Just drag your material back over the exposed mats at the end of your game or practice. 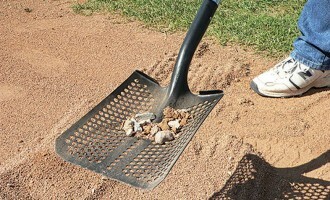 But if you can use bagged clay to repair your mound or batter’s box, then we have the tamp that groundskeeper’s love. This isn’t your father’s tamp. No, our SweetSpot Tamp (shown) will save your hands and back by reducing vibration with a self-articulating tamp head. That’s a fancy way of saying it saves wear and tear on your joints. It means you’re getting a flush, max-impact blow every time so you’re working smarter, not harder. * PRO TIP: If you’re using clay it’s imperative that you cover these areas with area tarps to help them maintain their moisture. If tarping is not an option the clay will harden and chunk out. No one likes a wobbly base. Always make sure to have a dig out tool around to clean out your base anchors. Cutting down soil around the bases is key to avoid an uneven surface for your base to sit on. But so is having a clean anchor to seat your base into. Use anchor plugs to keep material out of the anchor while you’re dragging or cutting down soil. But also use a dig out tool handy for clearing soil from the anchor. The other reason you need to clean out soil from the anchor? Rotational play. A properly installed base will have a little “rotational play” so the base stanchion doesn’t wedge in the anchor. Not only is that rigid base with no give a potential safety hazard for players, it means that base might actually get stuck, or at best become hard to remove. The simple, inexpensive — but effective — dig out tool is your answer. 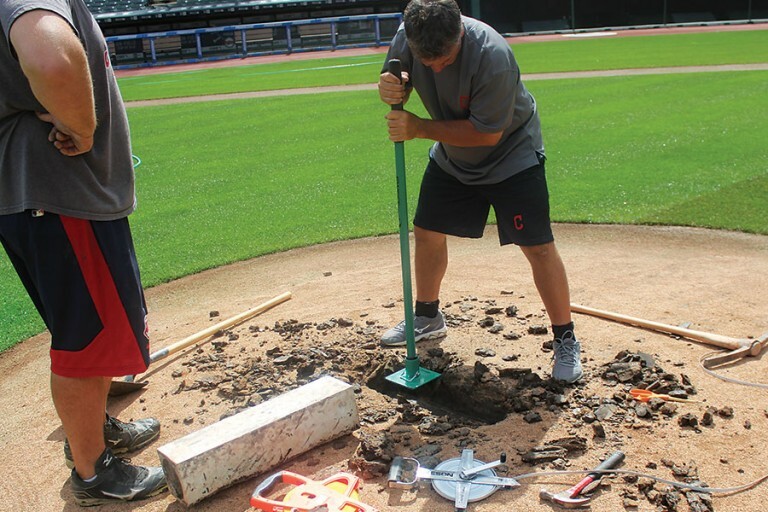 The Groundskeeper U lesson “On-field Maintenance & Placement“ will walk you through what you need to know with your bases and the importance of using the dig out tool. Okay, this tool you should already have. It’s an easy one to ignore or put off, but assigning someone to be in charge of managing your volunteers and coaches is crucial. This person will coordinate a field training day where all coaches are required to attend so they know the basics. Ideally before this meeting, you can have coaches and volunteers go through our free online training tool at Groundskeeper University to get everyone on the same page. This is strongly suggested. It makes life easier for the person in charge and will help you avoid preventable mistakes, which is definitely important after all the effort you put into your fields. 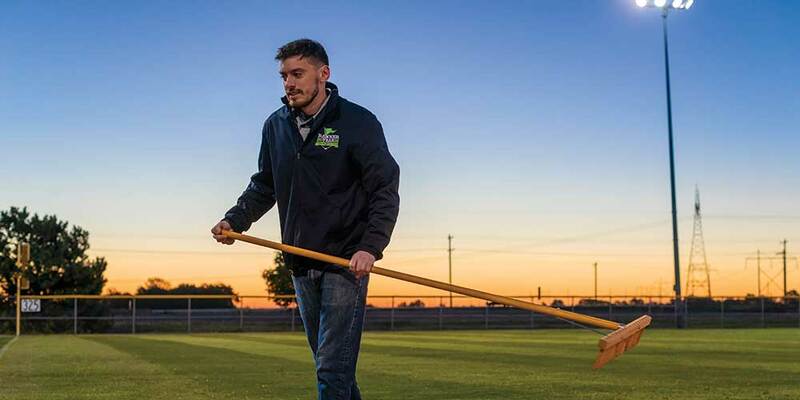 A lot of headaches will be spared when your field has some consistent maintenance and you’ll achieve a predictable result so the players know what to expect from your fields. * PRO TIP: One more plug for Groundskeeper University. Not as much a “plug” really, since you can use it at no charge, but we really want to make sure you are aware of this super valuable online resource. It will help you save a TON of time not having to manually train volunteers and coaches every year. Getting everyone doing things the same way it (and the right way) is critical. GU is authored by my Beacon colleague and former Baltimore Orioles Head Groundskeeper Paul Zwaska. These how-to modules and lessons are great for teaching the basics of field care and maintenance using audio, photos, diagrams, and videos with some short quizzes along the way to make sure you’re remembering what you need to know. Users can even become “certified” in the basics. Typically users only need 2-3 hours to go through all 8 lessons. Check it out. You and your team have nothing to lose and everything to gain.